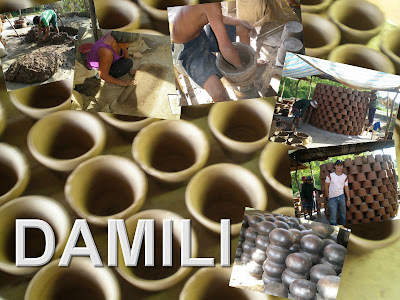 Damili is pottery. It is an Ilocano term for ceramic products made of clay. The town of San Nicolas in Ilocos Norte is known for its pot-making industry. Its government annually holds the Damili Festival in celebration for their main product. From the good clay soil material they use, they produce earthenwares of different shapes and sizes. Uses range from tablewares to decorative objects. They create vases, cooking pots, stoves, statues or images, and other formed or deformed figurines. Pottery is ceramic ware made by forming clay into different shapes and heating them up or firing them to introduce into a permanent setting which results to hardening and increased strength. Red earthenwares are usually painted with red dye whereas black earthenwares were burned. Unfired objects are often termed as greenware. The first stage of pot-making is gathering clay soil, wetting it with water and kneading. The potter then shapes this through the turntable and potter’s wheel or kick wheel. Last stage is the drying up or firing of the material. Firing of the material produces irreversible changes in the body and only after this method that can be called pottery. These earthenwares are usually marketed in Laoag City during the market days of Wednesdays and Sundays.